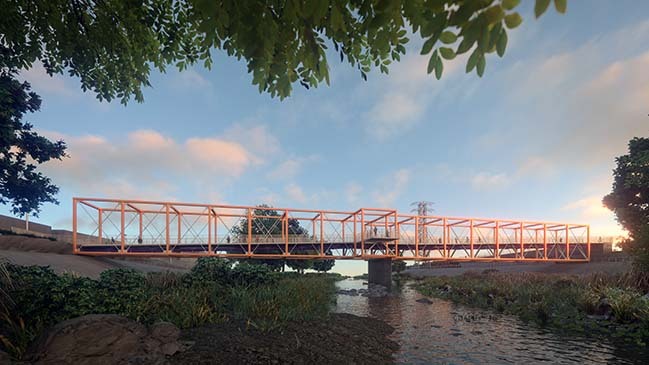 SPF:architects (SPF:a) is pleased to release new renderings for Rumblefish, a 400-foot pedestrian bridge spanning across the LA River and connecting Elysian Valley (Frogtown) to Taylor Yard, a 42-acre industrial parcel and former railyard site at the center of the city’s river revitalization plans. From the architect: Playfully referred to as Rumblefish in reference to the 1983 Coppola film about rival gangs and as a symbolic gesture to the area’s own history of gang violence, SPF:a envisions the officially-named Taylor Yard Bikeway & Pedestrian Bridge as a community collision of the peaceful kind, both a meeting point and a space for quiet contemplation of the river. 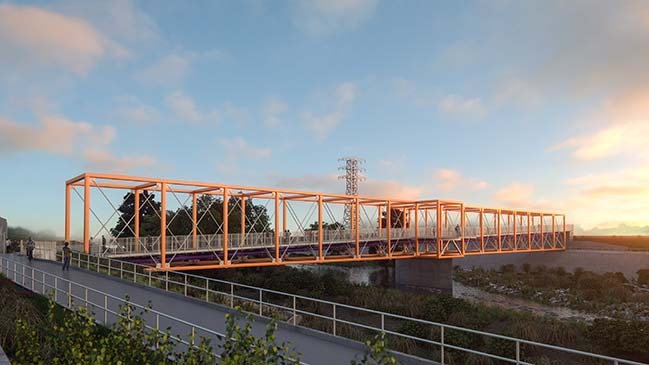 Influenced by classic railway bridges and the mid-20th century Los Angeles Case Study Houses, the simple geometric design and deliberate choice to employ the lightest structural elements possible (tube steel, wide flange steel, and steel rods) create the impression that the bright orange bridge simply “floats” across the river. The architecture of Rumblefish is uncomplicated, essentially the visual equivalent to an oversized box truss sloping from east to west. 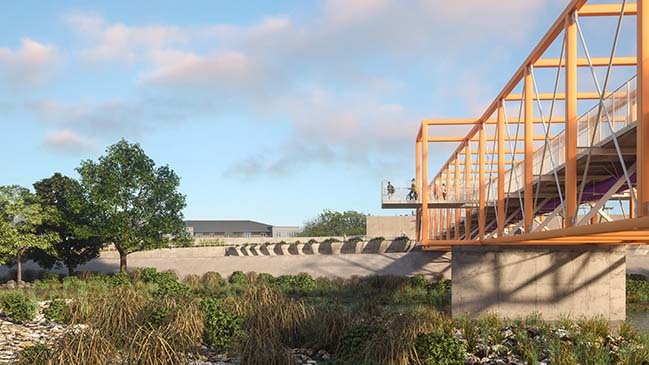 Like the bridge’s overall design, the connecting river path similarly seems to “float” within the steel beam medley, as the walkway tilts to meet the different elevations of the banks while the exterior structure itself remains level. 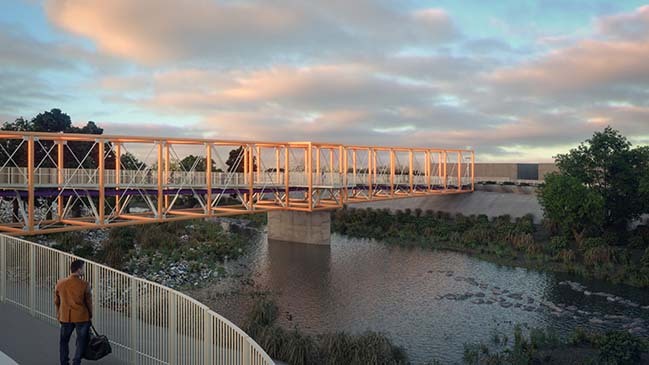 This track is an extension of the roads and walkways on terra firma and is the representation of the city’s path as it passes over the bridge—the truss is there to simply hold this path in place. 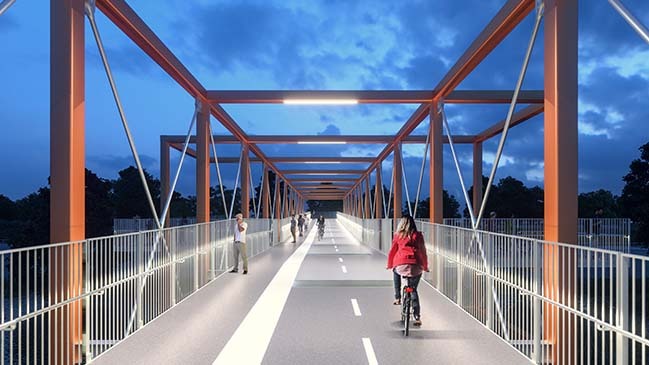 In February, the City Council committed $21.7 million to the bridge. 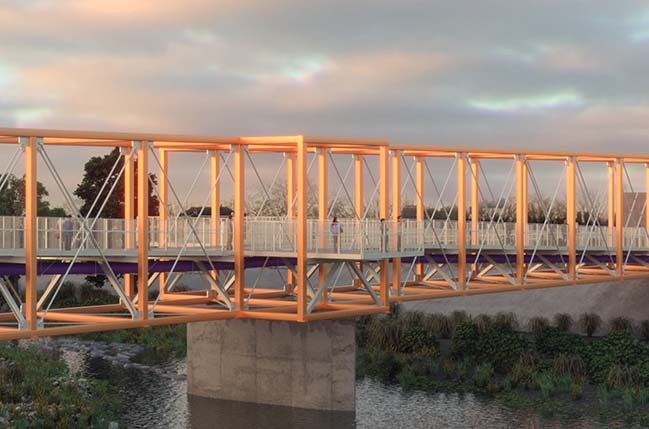 Construction will begin in July, with an expected opening date in the second half of 2020.